Combine all ingredients except cabbage in a saucepan and heat until liquid begins to simmer. Thinly slice cabbage and place in a bowl. Pour hot liquid over shredded cabbage and refrigerate for several hours or overnight. Preheat oven to 450F. Dice sweet potatoes and steamed tempeh into bite-sized pieces. Toss with a drizzle of oil, salt and pepper. Roast for 25 minutes or until they begin to brown. Combine sauce ingredients and microwave for 30 seconds. Stir mixture until a smooth sauce forms, adding water a tablespoon at a time until it reaches a thin, potable consistency. In a large bowl, toss roasted sweet potatoes and tempeh with the peanut sauce. 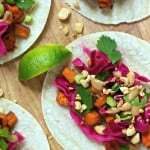 Pile tempeh-sweet potato mixture into tortillas and top with Quick-pickled Cabbage and other optional ingredients.